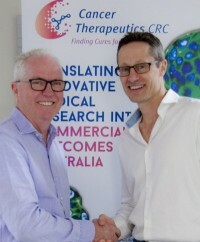 Cancer Therapeutics CRC (CTX) is pleased to announce the appointment of Brett Carter as Chief Executive Officer. Brett will succeed Dr Warwick Tong who has led CTX for the past 6 years and who will continue to provide services to the organisation in an advisory capacity. These changes reflect a transition plan agreed between Dr Tong and the CTX Board to evolve the organisation from a Federally supported Cooperative Research Centre (CRC) into an independent and self-sustainable organisation. “Cancer is Australia’s leading cause of pre-mature death and CTX’s unique and highly successful business model has resulted in the development of drug products that have the potential to provide cures for cancer patients. I am very excited to be taking over the leadership of an organisation with such a strong culture of innovation and delivery. To move from a medical research hub to a global biotechnology leader, Australia needs organisations like CTX, that build the drug discovery and development capability necessary to translate the country’s world class medical research into clinical and commercial outcomes.